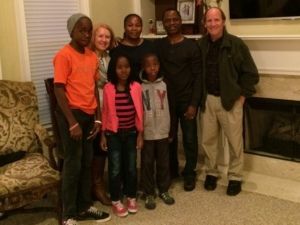 The Wheigar Family Miracle: "Care for Yeato in America"
My name is Isaac, from Liberia, West Africa. My wife’s name is Precious. The Lord has blessed us with five beautiful children (three with sickle cell disease). In His deep wisdom, God has called two of our sons home to Heaven due to the sickle cell disease. The recent one was our oldest son, Ike (17 years-old and in college). Ike passed away this past August (2014) because there was not one unit of blood in the whole country of Liberia to give him a blood transfusion when he went into a sickle cell crisis. This happened during the peak of the Ebola epidemic when the hospitals were closed and the few that were open had no blood. We were heart broken, now grieving, but trusting God in His mercy and love. We now have three living children, Andy (14), Yeato (9) and Sayou (7). And so we began to pray, asking the Lord to open doors if this was a path He was leading us on. A few weeks later, a Christian ministry in the U.S. contacted me and invited my wife and I to visit and attend a special training they were conducting. In a short space of time, God provided literally everything we needed to travel to the U.S. including 5 multi-entry Visas and 5 round trip plane tickets for our entire family! With the prevailing circumstances in Liberia and the fears in the U.S. associated with the spread of Ebola, this was a real miracle! We called Dr. Hillis in Atlanta to confirm the invitation to stay with her husband, Brian and their family. Within four days our entire family boarded a plane to America! Dr. Hillis contacted Children’s Healthcare of Atlanta and they offered to do an evaluation of Yeato's medical condition. They would also do a bone marrow test on our daughter and her two siblings to see if one of them would be a match. 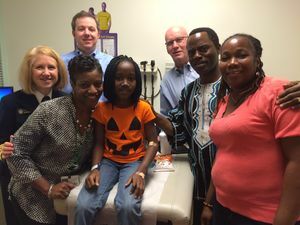 The test was done and the results came back two weeks later, showing our youngest son, Sayou, to be HLA-matched with our daughter! This means that Sayou, can donate healthy bone marrow to his sister for a transplant. The opportunity to receive treatment or possibly a cure for her of sickle cell disease is our hope. This would prayerfully extend our daughters life and save us from another heartbreaking loss! Finding a sibling donor match was the critical first step in the bone marrow transplant process. We praise God that step is now behind us. The next step was to raise over $500,000 required to pay for the transplant and other medical expenses. We were encouraged to share this need with a few of the children’s hospitals in the U.S. Several weeks ago I got a call from the Cincinnati Children’s Hospital saying that they would do the bone marrow transplant and at no charge to us! Before the end of that week, as we were still celebrating the Cincinnati provision, the Eagleston’s Hospital for Children at Emory said they would provide all pre-transplant medical care for Yeato, also at no charge! Our daughter has already started receiving needed medication and care at Emory for the sickle cell disease. We praise God for his merciful provision. The journey ahead is certainly still very long, considering the family expenses needed for us to live in America. We are now seeking the necessary Visa’s for an extended stay of several years to pursue the bone marrow transplant and follow up care. We trust God to allow Precious and myself to discover a new way to work and minister on behalf our family, friends and churches still suffering in Liberia. Even though Ebola is now under control, many are now facing a difficult recovery from the physical & emotional trauma in the aftermath of the epidemic and economic crisis. Currently, an international mission organization, based out of Atlanta, is considering a position for us, if the needed support and approval to join their staff is secured. We know that the Lord, who has begun this good work, will also complete it (Philippians 1:6). We would appreciate your prayers, encouragement and support as we discern God's will in the days that lie ahead. Isaac is a pastor and leader from Liberia, West Africa. He currently serves as CEO of The Association of Evangelicals of Liberia (AEL). AEL is the largest network of Evangelical agencies and churches and agencies of in Liberia responding to human need with guidance, compassion and practical care. He is also founder and president of The Association of Christian Schools of Liberia (ACSOL). ACSOL equips Christian schools to better educate Liberian children throughout the country. About 70% of all students in Liberia attend private Christian schools. Donations can be received by the The National Christian Foundation directed for Yeato & the Wheigar family through The CoMission For Children at Risk, a qualified 501(c)(3) non-profit ministry. (EIN 27-0816608). (www.comission.org). To receive more updates or for inquiries, e-mail us at: CareForYeato@comission.org. The Wheigar family is currently being hosted by Dr. Susan & Brian Hillis and Dr. Ron Braund.